With one of the fastest growing economies of any country, Brazil has emerged as an increasingly influential player on the world stage in recent years. The country is the largest by size in South America, and the fifth largest in the world by land size and population. Though Brazil is still only considered a middle power in terms of its economic and political clout internationally, the country already has the world’s seventh largest economy in terms of Gross Domestic Product (GDP). Much of Brazil’s impressive growth has resulted from progressive economic policies that were put into place about two decades ago by its democratically elected government system. Many economists and political strategists have little doubt that Brazil will emerge as an economic superpower over the next two decades or so if its growth persists at current rates. Brazil is bordered by the Atlantic Ocean to the east, and by as many as 10 countries on its western, southern and northern borders. Among the countries that share a border with Brazil are Bolivia, Peru, Uruguay, Paraguay, Argentina and Venezuela. The country has extremely diverse wildlife, natural habitats and natural resources. The country is a huge exporter of products, ranging from aircrafts and aircraft components, to automobiles, commodities, textiles and footwear. Brazil’s capital is Brasilia, but its biggest city is Sao Paola, which has a population of over 11.4 million people. Other major cities in Brazil include Rio de Janeiro and Salvador. Over the years, Brazil has emerged as one of the largest car markets in the world. Even so, international shipping to Brazil from the United States and other parts of the world is a fairly complicated task. Numerous Brazil international shipping companies today offer door-to-door vehicle shipping services from any location in the United States to any location in Brazil. Most cars are shipped to Brazil via sea in containers or on board Roll on Roll off vessels. Shipping a car to Brazil from the U.S., or shipping a car from Brazil to the United States in a container, can be an expensive proposition. Shipping companies typically charge between $5,500 and $7,000 to ship a car from Miami to Brazil in a container. RoRo shipping costs are substantially cheaper, and start at around $1,800. Brazil permits almost anyone to import a car into the country so long as it is for personal use. 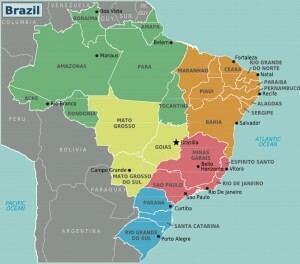 However, there are several factors that need to be considering when shipping to Brazil. Brazil permits only new cars or vehicles that are older than 30 years old to be imported into the country. All vehicles need to meet the country’s emissions control and safety standards. Brazilian residents need to obtain an import authorization permit and get an approval from the country’s environmental affairs agency before they can import a car. Similar restrictions exist from those looking to import a car from Brazil to the United States. Numerous brokers and shipping companies are available in both the United States and Brazil to help individuals import and export cars between the two countries. Many of them are experts at what they do, and can help customers with all the paper work and documentation needed to import or export a car between Brazil and the USA.